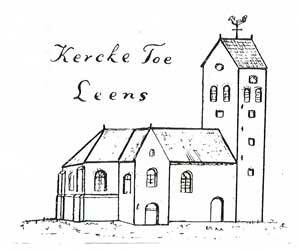 A short history of the Petruskerk and organ of Leens. In former times the sea flooded freely over the land because there were no protecting dikes and dunes. People created "hills" from salt marshes, waste and manure for their private use and later on in cooperation with their neighbour. People protected themselves, their cattle and houses this way. For that reason the chapel of Leens was built on a "hill". Before the Reformation it was a catholic church devoted to the apostle Petrus. Her old name was St.Pieter, now it is Petruskerk. The church of Leens was built about 1150. In the 13th century the chapel became a cruciform church. It was the central church of the area. The tower was built, in all probability, in the same century. A number of renovations have taken place over the years. The family Onsta Starkenborgh felt themselves closely involved with the church and village. They were beneficiaries of the church and they decorated the interior of the church. EENERLEY BIDDE ICK VAN DEN HEERE, DAT HADDE ICK GEERNE, DAT ICK IN DEN HUYSE DES HEEREN BLIJVEN MOCHTE MIN LEEFDAGE TE ANSCHOUWEN DE SCOONE GODSDIENSTEN DES HEEREN END ZIJNEN TEMPELL TE BESOECKEN DOOR HET VYERS KRACHT BIN ICK GEFLOTEN, MEYSTER NICOLAS SICMANS HEEFT MIJ GEGOTEN INT YAR CHRISTY MDCXXXII PSALM XXVII VERS IV. I pray to the Lord that I may be allowed to stay in the house of the Lord and in His Temple to observe the service of the Lord. MEYSTER NICOLAS SICMANS made me in the year Christy MDCXXXII PSALM XXVII VERSE IV. 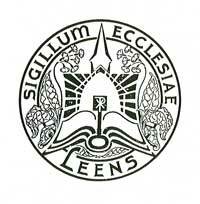 The church seal of Leens has been in use since 1953. Sigillum Ecclesiae Leens - Church seal of Leens. The background is decorated with a design derived from the "key flower" (primula) which reminds one of a cluster of keys suitable for opening doors. In medieval monastery gardens this plant was called : Clavis Petri Coeli - Peter's key to heaven. Albertus Anthoni Hinsz was born in 1704 in Hamburg. In 1728 he came to the city of Groningen as a trained organ builder and established himself as an independent organ builder there. 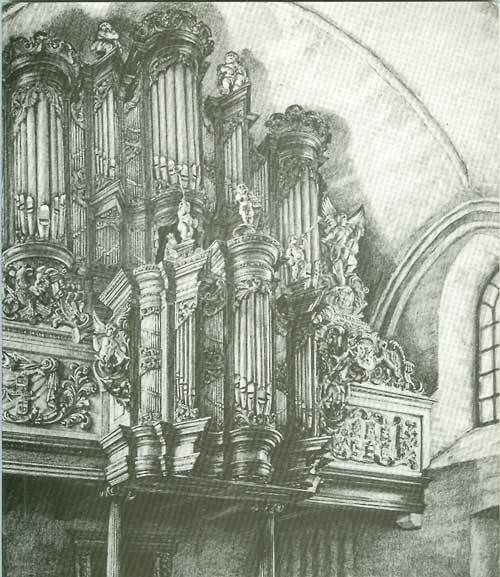 When Frans Caspar Schnitger died in 1729, his widow Anna Margaretha Debberts continued with the organ work. With the help of Hinz, the work that Schnitger had started in the Martini Church in Groningen was completed. In 1732, Hinsz married the widow of Frans Caspar. The Hinsz organ of Leens. "The great beautiful organ in the west-end of the church is, on the thirty-first of January 1733, by Mrs. Anna Habina Lewe, widow Starkenborgh, Lady of Verhildersum and Leens, contracted out to organmaker A. Anthoni Hinsz, in Groningen. The original drawings and documentation are in my possession." Hinz accepted the work for 3400 guilders to be paid in three installments. It was Hinsz first great organ. "The specification indicates close correspondence with the usual North-German organ building practices. The names people gave him were: "Konstmeester (art-master) and "Konst-kundig" (artist). The organs of Albertus Anthoni Hinz deserve praise for their ability to touch the soul: the result of an effective layout and solid construction, magnificent exteriors, and last, but not least, the two centuries old sound that continues to move and inspire. A special word of thanks to Jan Oostindiën ( chairman of the SGO ) for his cooperation and kindness.